Had To Be Ivory, under jockey Tony Phillips, pushes his perfect record to 6-for-6 with a win in the $17,285(US) Bonus Challenge Derby at Ajax Downs. AJAX, ONT�JUNE 17, 2018�Had To Be Ivory ran his perfect record to 6-for-6 on Sunday when he defeated Carneros by half-a-length in the $17,285(US) Bonus Challenge Derby at Ajax Downs. Silky Senator finished another length back in third. Making his 2018 debut, under a hand ride by jockey Tony Phillips, Had To Be Ivory completed the 300 yards in a quick :15.200 clocking to earn a 107 speed index with a 12 mph tailwind. Trainer Bryn Robertson conditions the Ontario homebred for owner-breeders' Carol and Jaime Robertson. 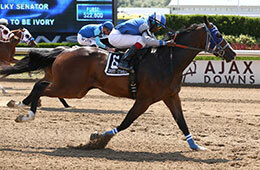 The son of multiple stakes sire IVORY JAMES picked up $8,134(US) to boost his career mark to more than $78,000. Last season the bay gelding won the Ajax Juvenile Challenge and Alex Picov Memorial Futurity. He is out of the stakes winning Hadtobenuts mare Had To Be Fandango. Trainer Jason Pascoe saddled runner-up Carneros for owner Milena Kwiecien. Ed Walton had the riding call aboard the Oklahoma-bred son of three-time champion Prospect To The Top from the Valiant Hero mare Cakebreak And Thou. Bred by Stone Chase Stables, the multiple stakes-placed Carneros was second to Had To Be Ivory in the Ajax Juvenile Challenge last season. Carneros entered the race off back-to-back allowance wins at Ajax Downs after making his 3-year-old debut for a $20,000-tag at Remington Park in April. He picked up $4,067(US) in the Bonus Challenge Derby to bring his earnings total to $27,673. Pascoe also trains third-place finisher Silky Senator, an Oklahoma-bred daughter of Louisiana Senator owned by Amelie Aubut. Charles Robinson bred the bay filly from the Royal Quick Dash mare Denali Peak. Also multiple stakes-placed, she increased her bankroll to $18,509 after earning $2,033(US) today. She was third in the aforementioned Ajax Juvenile Challenge last summer. Hardtostopatrain and Island Vodka completed the field. Favorite Pearl was scratched. All the Ajax Downs events can be found at ajaxdowns.com.